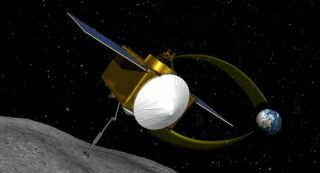 An artist's interpretation of NASA's asteroid-sample mission OSIRIS-REx, which will rendezvous with the near-Earth asteroid Bennu (once known as 1999 RQ36) in 2020. NASA is calling on students around the world to help name a potentially dangerous near-Earth asteroid that the agency is hoping to visit with an unmanned probe that will collect samples of the space rock and return them home. The asteroid, currently known as (101955) 1999 RQ36 could pose a threat to Earth when it swings close to our planet 170 years from now. Measuring 1,837 feet (560 meters) wide, asteroid 1999 RQ36 has a 1-in-1,000 chance of slamming into Earth in the year 2182, researchers have said. NASA is planning an ambitious mission to return samples from the surface of 1999 RQ36. The expedition, called Osiris-Rex (short for Origins-Spectral Interpretation-Resource Identification-Security-Regolith Explorer), is scheduled to launch in 2016. The Osiris-Rex mission is expected to cost $800 million, a figure that does not include the cost of a launch vehicle, agency officials have said. Samples brought back by the Osiris-Rex mission could help scientists unlock some of the mysteries of the solar system's origin some 4.5 billion years ago, and the organic molecules that may have led to life on Earth. NASA is also planning to launch astronauts to an asteroid by the year 2025. "Because the samples returned by the mission will be available for study for future generations, it is possible the person who names the asteroid will grow up to study the regolith we return to Earth," Jason Dworkin, Osiris-Rex project scientist at NASA's Goddard Space Flight Center in Greenbelt, Md., said in a statement. The agency's competition is open to students worldwide, under the age of 18. Each participant may submit one name, which can be up to 16 characters in length. Students are required to also include a short explanation for their suggested name. "Asteroids are just cool and 1999 RQ36 deserves a cool name!" Bill Nye, chief executive officer for The Planetary Society, said in a statement. "Engaging kids around the world in a naming contest will get them tuned in to asteroids and asteroid science." The deadline for entering the contest is Dec. 2, 2012, and submissions should be made by an adult on behalf of the student, NASA officials said. A panel of judges will then review the submissions, and a winner will be announced when the chosen name is approved by the International Astronomical Union Committee for Small-Body Nomenclature. "Our mission will be focused on this asteroid for more than a decade," Dante Lauretta, principal investigator for the Osiris-Rex mission at the University of Arizona in Tucson, said in a statement. "We look forward to having a name that is easier to say than (101955) 1999 RQ36." Asteroid 1999 RQ36 was discovered in 1999 by the Lincoln Near Earth Asteroid Research survey at the Massachusetts Institute of Technology's (MIT) Lincoln Laboratory in Lexington. This space rock census is part of NASA's Near Earth Observation Program in Washington, D.C., which aims to catalog near-Earth asteroids and comets. The clunky name (101955) 1999 RQ36 was designated by the Minor Planet Center, which is operated by the Smithsonian Astrophysical Observatory in Cambridge, Mass. Once a newly discovered asteroid is characterized, and certain criteria are met to establish its orbit, the Minor Planet Center gives it an initial alphanumeric name. NASA is hosting the asteroid naming contest in partnership with The Planetary Society in Pasadena, Calif., MIT's Lincoln Laboratory, and the University of Arizona.